Boyd Davis, Stephen, 2015, Journal Article, Beholder of All Ages: The History of the World in a French Mappemonde Textimage: revue d'étude du dialogue text-image, 7 (1). pp. 1-6. ISSN 1954-3840 Item not available from this repository. Boyd Davis, Stephen, 2015, Book Section, May not duration be represented as distinctly as space? 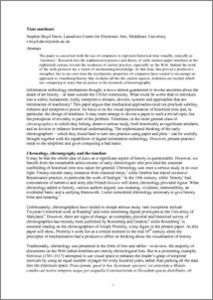 – geography and the visualisation of time in the early eighteenth century In: Beck, David, (ed.) Knowing Nature in Early Modern Europe. Warwick Series in the Humanities, 5 . Pickering and Chatto, London, pp. 119-137. ISBN 978 1 84893 518 1 Item availability may be restricted. Boyd Davis, Stephen, 2017, Book Section, ‘To see at one glance all the centuries that have passed’ - early visualisations of historical time In: Black, Alison, Luna, Paul, Lund, Ole and Walker, Sue, (eds.) Information design: research and practice. Routledge, London, pp. 3-22. ISBN 978-1-4724-3070-0 Item availability may be restricted. 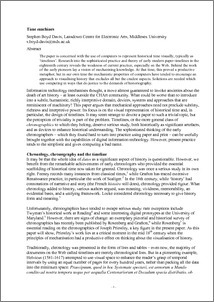 Boyd Davis, Stephen, Bevan, Emma and Kudikov, Aleksei, 2013, Book Section, Just In Time: defining historical chronographics In: Bowen, Jonathan, Keene, Suzanne and Ng, Kia, (eds.) Electronic Visualisation in Arts and Culture. Springer Series on Cultural Computing . Springer, pp. 243-257. ISBN 9781447154051 Item availability may be restricted. Boyd Davis, Stephen, 2010, Conference or Workshop, Time machines. at Technology and ‘the death of Art History’: Computers and the History of Art annual conference, The British Computer Society, London, 10-11 November 2010. This list was generated on Thu Apr 25 08:52:56 2019 UTC.